We all are familiar with the popularity of Apple's iPhone. It's like a charm if you've got an iPhone. No one is going to ask you about your Smartphone whether you've purchased it at a price similar to iPhone. But it's the iPhone which rise your status in the society. Similar to Android iPhone too has secret codes. But you won't be able to find many. In one of my previous article I covered over 150 secrets codes for Samsung. And according to me it was a complete list of codes for Android platform. One can easily open the door of hidden features using these codes. 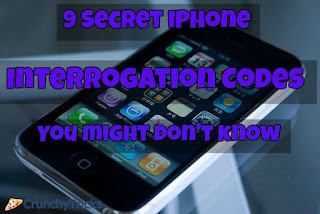 On Android we simply call them either hidden codes or secret codes but for iOS platform one special name called "Interrogation" is given in the market. There's nothing you need to learn to operate over these codes. They consists of some numbers along with asterisk (*) and #. Just open up your dial pad, put the code and hit call enter. That's it, hidden menu would appear in front of you. We might need to check sometime whether network or calling feature is working properly or not. May be you want to toggle certain functions on or off then at that time it's the only option left for you. As no one won't provide toggle option for all the features. Just use the specific code, open up iPhone hidden menu and Interrogate your Smartphone. There's nothing like wow! it was mind-blowing but surely these codes would be a fun dose for you. We've listed almost all the working hidden codes here. They are compatible with all the versions such as iPhone 4, iPhone 4S iPhone 5, iPhone 5C, iPhone 5S, iPhone 6 and iPhone 6 Plus. IMEI stands for International Mobile Station Equipment Identity consists of 15-digit code. It identifies your phone uniquely on GSM, UMTS, LTE and iDEN mobile phones. IMEI code is helpful if in any case you've lost your iOS device or it is stolen. A common man doesn't have tracking tools but telecoms companies your Smartphone using your IMEI number. You'll be using it while filling a complaint against your stolen phone. Remember insurance companies also demand for IMEI code. Simply use the above code to find your IMEI number or navigate to Settings>>General>>About. Apple has also printed it on the original box of your mobile phone. If you're searching for your carrier's text message center number then simply dial the code given above. Don't forget to press call button (Green Button In Most Of The Cases) once code has been entered. To change your message center number simply dial **5005*7672*SMSCNumber# and press call button. Dial the code given above and make a call and then you can easily notice signal numbers in the upper left corner. On pressing home button you'll be thrown out of the test mode and signals would convert again to bars or dots. You might don't know but you can read data from surrounding tower through field test menu. Try to get around menus to find some more hidden information on iPhone. If in any case your iPhone stops showing numbers then you can use this code to display the numbers of incoming calls. The very first thing is that this mode doesn't work for all networks. If it's working then you're lucky. Enhanced Full Rate allows user to improve voice quality between GSM networks. It's a speech coding standard. Give it a try and check whether it works for you or not. You can improve network quality once entered in this menu. iOS operating system doesn't have any setting to block outgoing calls. But yo can easily solve this problem using the above code. Call barring is used to restrict your phone from making or receiving calls. You can check it's status using above code. On enabling this setting you will be easily able to receive other calls while there's already a conservation going on. You'll be notified through sound that another person is calling you. Now it's up to you whether you wanna continue current call or shift to new one. Call forwarding is a feature which allows you to redirect you calls to another number. Sometime you don't want to attend calls of a specific person or might be on holiday then just use call forwarding service to redirect your calls. It allows you to hide your phone number in outgoing calls. Use the above code to check your outgoing calls anonymity. #31#phone number + 'Make A Call' : To hide your phone number for current call only. So this was all about all the secrets codes of iOS. Let us know if they are not working for you. If you've got new codes then feel free to mention them in the comment section below.